It’s been nearly eight months since Emily was born, and in that time she has amassed an enviable collection of toys – from squashy cuddly things which are good for chewing and throwing to hi-tech toys which bleep and whistle and make all manner of noise. And it’s the latter which baffle me – not least their ability to start making a noise all by themselves. I have lost count of the number of times I’ve picked up Laugh n’Learn Puppy once little girl is in bed only to have it start singing and chattering of its own accord (due to its super-sensitive controls). The trouble is, of course, not only does it burst into song at the slightest touch, it does it at the most inopportune moments. Puppy is one of Emily’s favourite toys and as such it always accompanies her when I am at work and she spends the day at grandma’s place. Yet I have lost count of the number of times I’ve carted it down the stairs to the car, only to treat all our neighbours to a medley of Head Shoulders Knees And Toes, The ABC Song and other kiddie classics on the way down – simply because the lightest movement is likely to set it off. Once it even carried on once it was locked in the boot of the car, leaving Emily to stare around, wondering what had happened to her pal. Her toy radio, something else she loves, also has a habit of revealing its musical content when it’s picked up and put away at the end of the day – and once our cleaner got a surprise when she moved it out of the way of the vacuum cleaner, only for it to respond accordingly with a tune or two. And this evening I moved my legs further under the table, only to feel a vibrating movement. Further investigation revealed that I had accidentally pressed the ‘on’ switch on Emily’s bouncy chair with my feet. Perhaps most alarming, however, is the way in which Baby Tad has been behaving lately. After months of staring at it in wonder, Emily has decided she loves Tad and it is a frequent visitor to her cot when she is in there during the day. Yet there have been a number of incidents recently when I have been in the lounge with her, only to hear Tad singing in her room (despite there being no-one in there to press the on switch). How this happens, I have no idea. But given my previous conviction that Tad is a little on the scary side, I’m not sure I want to know. When Emily was tiny, something as simple as eating a meal proved to be a tad difficult. At best, we would wait until she was asleep before attempting lunch or dinner, hoping she wouldn’t wake up until the last mouthful had been eaten – at worst, we would have to take it in turns to eat to prevent her from screaming all the way through the meal. Now, though, it’s a very different story – we simply pop her on the playmat with her toys when it’s dinner time and she pleases herself (which these days means crawls into the corner in an effort to chew on my laptop cable, the TV aerial or any other high risk item which looks just too tempting to resist). Recently, however, she’s started finding meal times incredibly funny and I can’t quite imagine why. This evening, for instance, we were tucking into our sushi while she was kicking away on her mat, when suddenly she began giggling at nothing. I’ve yet to work out what it was that amused her, but from that point she seemed to find everything absolutely rib-tickling. At one point I glanced at her and she burst into yet another fit of the giggles – yet I had done absolutely nothing that anybody could possibly find funny. It’s not the first time this has happened either. It’s become quite common for me to spend meal times amusing her between bites of food, until she loses interest and heads off in search of a phone charger or chair leg to nibble. I have to admit it’s infinitely preferable to having her scream all the way through dinner – even if it’s just as distracting. Having posted recently about Emily’s fondness for sleeping in her grandmother’s armchair, it seems I have stumbled upon a way of getting her to take a nap in mine. Yesterday afternoon I was getting her ready to go out, and she was noticeably tired, but figuring she would nod off in the car I put her coat on – a big pink puffy number which we bought the other week – and popped her in my chair while I went to get myself ready. When I returned to the room, however, she was fast asleep in the chair. Perhaps in future if I’m having trouble getting her to take a nap I should just put her coat back on? Yes, But What Is It For….? Sometimes I’m baffled as to the logic behind certain inventions designed to make babies’ lives easier – while these things may seem logical to a grown-up, present them to the baby for whom they were intended and it’s a very different story. The other week, for example, I decided to experiment with giving Emily her water in a lidded cup instead of a bottle, since she has been quite happily drinking from her bottle without help (well, she has been putting it furiously, but hasn’t quite realised that you have to tilt it to actually get any liquid out, hence she spends ages sucking in air and looking rather confused). 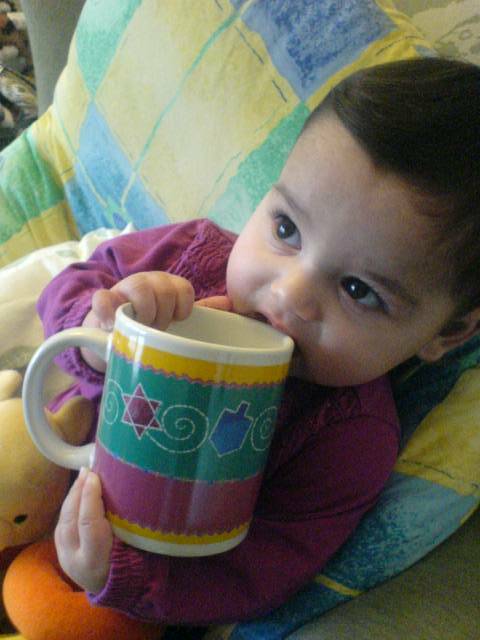 Sure enough, she reached out for the cup, as she is doing for everything offered to her or within grabbing distance these days. She then proceeded to turn it upside down and push the bottom of it into her mouth, scattering water everywhere as it spilled out of the lid. At which point I decided she probably wasn’t ready for it just yet. Today, meanwhile, I attempted to soothe a bout of teething discomfort with a special ‘teething biscuit’ that babies apparently chew on to relieve their aching gums. According to the instructions on the packet, you thread a piece of string through a hole in the top of the biscuit, attach it to baby’s clothing and then they happily gnaw away on it – cue end of discomfort. In reality, what actually happened was that I diligently followed the instructions then held it out to Emily – who then proceeded to stare at it, play with the string, wave the biscuit around in the air and eventually throw it on the floor (meaning of course it had to go in the bin rather than in her mouth). And it’s hardly surprising really. I mean, how was I supposed to explain to her what the biscuit was for? Some things of course she is capable for figuring out for herself – toys are for playing with, food is for eating, Mummy and Daddy are for crawling all over and headbutting at inopportune moments. But naturally I’m now left wondering how you explain other mysterious objects to a baby. Maybe if they also came with instruction manuals it might make the whole process easier. One of Emily’s favourite things – something she’s been fond of since she was a tiny newborn in fact – is to go for a ride in our car. And the fact she enjoys it has come as a huge relief to me, given that babies can be a tad unpredictable where motor vehicles are concerned – some love it, others absolutely hate it, which can’t be much fun for either baby or parent if you’re sitting in a traffic jam or speeding down the motorway at 70mph. At first she used to spend most of her travelling time asleep – we would barely have put the key in the ignition and her eyelids would be drooping – but while she’s still given to taking naps in her rapidly shrinking car seat, she has also discovered the joy of having an in-depth conversation mid-journey. Of course she can’t say any actual words yet, so what we get instead is a stream of random sounds and babble (which presumably constitute words in her language), but the sheer enthusiasm of her chatter – to say nothing of the volume – suggest that she’s enjoying the journey, since she seems to be far more vocal in the car than she is elsewhere. I generally provide my husband with a running commentary when this happens, although on occasions when I’m not in the car he has to supply his own translation. She also gets to look out of the window now at passing vehicles and other sights, something she was unable to do previously due to the sunshade we fitted over the window. I installed this just before Emily was born, since she was a June baby and last summer was a scorcher, and there it stayed until a couple of weeks ago when I suddenly realised that a sunshade probably wasn’t necessary in a cold, grey British winter. So she can now see what’s going on, and is particularly fascinated by lorries, buses and other large noisy vehicles that take up more than their fair share of space on the road. Quite what she makes of it all is anybody’s guess, but her reaction is always fun to watch. I am delighted to report that after months of sitting in the plastic trolley seat at the supermarket, Emily has finally graduated to the other seat – the one intended for older babies who have gotten the hang of this whole sitting up business. On today’s trip we originally intended to put her into the plastic seat as per usual but she proved just too big (the fact she was wearing a large puffy coat we bought her at the weekend probably didn’t help either) and we were unable to fasten the straps around her. I subsequently suggested that since she’s gotten the hang of sitting up straight in her high chair, that she might be ready for the other child seat – the one that allows her to sit up and put her feet through the gaps provided. And sure enough, she loved it. Quite aside from the freedom it gave her to dangle her legs over the edge of the trolley, it also meant she could look around the store properly, as opposed to the somewhat restricted view the other seat gave her. 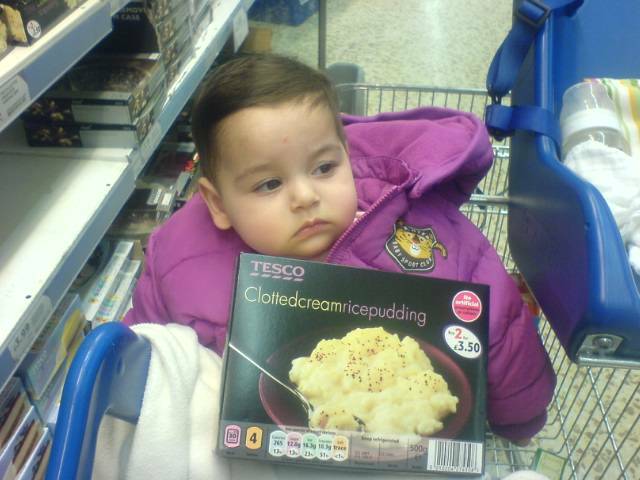 As the accompanying photo shows, it also gave her a chance to recommend some groceries to us. Yet I remember a time, not so long ago, when she was too small even for the plastic seat and had to ride in the trolley sitting in her car seat. I’m sure it’ll be only a matter of time till she’s pushing the trolley herself (and no doubt loading it with yet more of Mummy and Daddy’s favourite indulgent desserts) and I’ll be wondering just where the time has gone. One week on, and Emily’s crawling is coming on a treat. Not only is she becoming noticeably faster, but she’s revelling in her new-found mobility and the possibilities it offers. Suddenly, everything is even more of an adventure than it was before, and it’s not uncommon for me to pop her down on her playmat, only to find her underneath my chair ten minutes later, staring up at me as if seeking my approval. This development took on a whole new turn yesterday when, while I was having lunch, Emily discovered my seat cushion, and more importantly the fact that it has tassels on which can be pulled. Consequently I sat eating my food while a little hand tugged away, repeatedly, as though the seat cushion were some marvellous new toy. As a finale she discovered the chair legs, tried to eat them, then subsequently rolled on to her back and got wedged between the chair and the table leg. 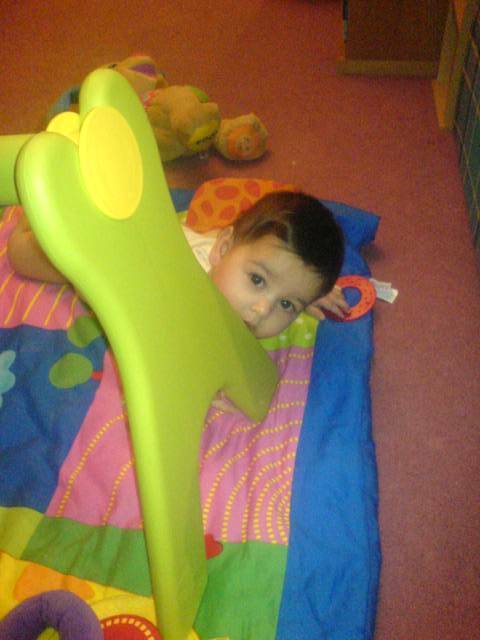 At which point she decided she was not happy and wanted Mummy to put her back on the playmat, pronto. But the best way we have discovered to really get her on the move is to put her on our bed and then put our phone – still her very favourite toy – just out of her reach. Cue much frantic scrabbling and waving of arms before she pushes herself across the bed at top speed in an effort to reach it. We still haven’t quite figured out why she finds it so fascinating, but anything which gives her an opportunity to try out her new-found skill is fine by us. Ever since I went back to work, Emily has been spending two days a week with my mother-in-law – and she’s made herself right at home there. So much so that she spends much of the day sitting in her armchair – playing with her toys, watching the world go by and even taking lengthy naps there. I am told that she thinks nothing of nodding off in the chair and sleeping for a good couple of hours without a second thought. Which beggars the question: how come she never does that for me? To be fair, she’s been a pretty good sleeper up to now and is very good at settling herself at night, but daytime naps are another matter entirely. Take her for a ride in the pushchair or a drive in the car, feed her or give her a drink and often she’ll be out for the count. However, put her down in the cot without attempting any of these things and she’ll simply think it’s playtime. I also have a very comfortable armchair at home and often let Emily sit in it when I’m getting her meals ready and at other times of the day – yet not once has she ever fallen asleep in it. In fact, she much prefers sitting in it wide awake, cooing and trying to eat her feet. I have no problem nodding off in it myself – usually when I’m midway through watching a TV programme I really really want to see – but it appears to have the opposite effect on my daughter. Which leaves me wondering why my mother-in-law’s chair has such soporific properties. Perhaps I need to sit in it myself to discover its secret? It appears that the day we have been waiting for – the one in which Emily discovers crawling – has finally arrived. Well, sort of. Yesterday evening, about an hour before bedtime, she was lying on her front on our bed, trying (as per usual), to reach something that she isn’t supposed to have (our phone, to be precise), when she suddenly propelled herself forward with her knees, sliding along on her tummy as she did so. At first I couldn’t quite believe what I was seeing, or thought perhaps it was some kind of fluke, but then she did it again. At this point I called my husband in, and of course she immediately stopped what she was doing (I’ve lost count of the number of times she has done something terribly clever for me, only to then refuse to repeat it for other people). To prove that this wasn’t some freak occurrence, I took her to see our next door neighbours, who provided the temptation of their TV remote control (another one of Emily’s favourite things) just out of her reach. And sure enough, she pushed herself forwards again in order to grab hold of it. And then did so once more. So it appears that we have progressed to some form of crawling, albeit slowly and hesitantly – but given how quickly she has learned to turn herself round in circles, I’m sure it’ll only be a matter of time before she speeds up. And then the days of staying exactly where she is put will be just a distant fond memory.